Brutal. Print this out and try it. This is the “Captain’s Gauntlet”, found in my latest Finishers Manual, “Super Finishers”. Fat Loss program at 50% off this week only through the link above. 1E) Captain Chops (3/side)Now that’s how you finish off any workout.“Mikey, what the hoot is a Captain’s Chop?”.First, I find it hilarious you said, “hoot”. Second, don’t worry; I got my shirt wet just from getting the photos ready for these new exercises. I also have some goodies such as the Batman Lunge and the Hulk Jump. 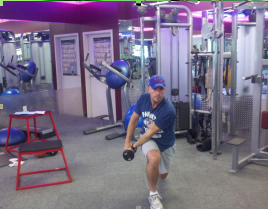 The best way to describe it – lunge and chop at the same time. Here’s the best part – you can create your own Grand Finale by replacing any of the finishers in Metabolic Chaos with any of the Super Finishers. You get both of these when you get my friend Roman’s new Super Hero Fat Loss program through the discounted link below. “Mikey, what is Roman’s Superhero Fat Loss”? I have the answer for you imaginary person made up in my head so I can type that question. Sorry Romanz. Why you jump so much?? endurance, strength, speed and power. and perform like a SUPER HERO in the comics. Let me be transparent here. This program is 100% pure vanity. It’s designed to make you lean, with dense muscle, but still capturing an athletic look, much like a Super Hero. And yes, it works for women as well – as a matter of fact, he has a component JUST for women. But the big plus with this program is the way it is designed. You will not only lose fat and create a more athletic look, but you’ll also become more athletic.That’s what this program delivers. Roman’s programs have even inspired some of my finishers. One of my favorite techniques he uses is what’s called “density circuits”. What’s a Density Circuit Mikey? This is when you set a timer for a certain amount of time and then proceed to do a circuit of 3-6 exercises (sometimes more, depending on the phase) with a certain rep range. You do as many as possible in that amount of time. This will exhaust your muscle’s glycogen while putting in a ton of volume in a little bit of time. This leads to fat loss, but it also leads to more athleticism. 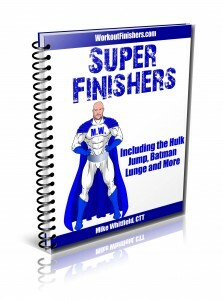 Metabolic Chaos – A Metabolic Resistance Training program with metabolic finishers including the zany, but effective strength and finisher supersets in Workout B.
Super Finishers – My latest finishers you can plug in with any workout including new exercises like the Batman Lunge and the Hulk Jump. You’ll love the Batman Lunge – you’ll work too many muscles in just one move. Step 2. Forward your receipt to us at cranktraininghelp@gmail.com and we’ll send you BOTH Super Finishers and Metabolic Chaos. Don’t forget, you can even choose your own grand finale by replacing the finishers in Metabolic Chaos with one from the Super Finishers manual. The Captain’s Gauntlet is awesome! One question, where do I begin the chop at? I started with the dumbbell at my ear and brought it down or do I start it up higher? Glad to hear you liked it! I like to start with my arms extended above my head to one side. I hope that makes sense.